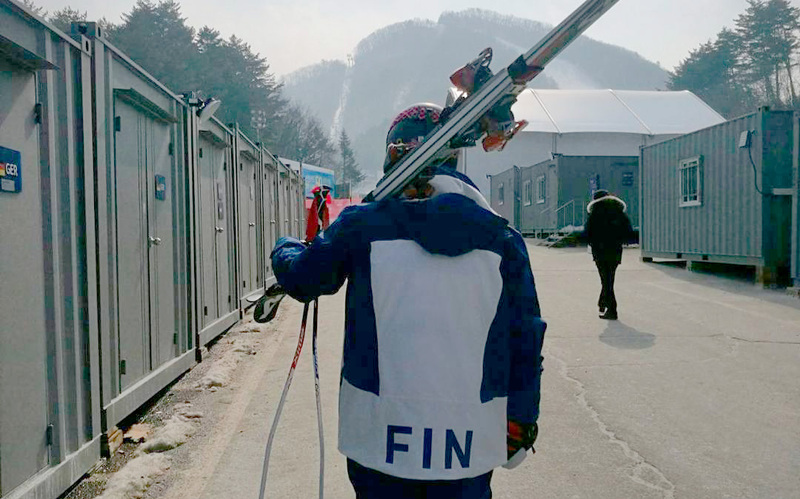 Samu just finished 17th in the PyenongChang Olympic Winter Games which is his best world cup level result so far. He had been fighting a flu for a week and was able to do any of the preparing exercises they normally do for contests. Torsti said that surprisingly afer being in bed for a week he felt really good and was ready to let it rip. Afer crossing the finish line during his first run he was pretty tired though. He was 22nd afer his first run and felt like there was a lot to improve and just needed to give his all. His second run got him the leading position which Samu said felt extremely good. He was able to ski the bottom part of the track hard and gain time what he’d lost on the top part. His plan to just ski full on in the second run worked out great. Samu says he barely made it to the contest because of being sick. He was very satisfied of the results especially since he was still bed ridden on monday. Torsti said he still has work todo and it’s a day-by-day progress for the rest of the season to get his body working correctly. He’s very confident that there are really good contests ahead.